I'm often asked whether I prefer my scones jam first (Cornwall-style) or cream first (Devon-style), to which I usually reply "I am from Kettering. Our local produce is Weetabix." But today, for the very first time, I took my fence and attempted to sit on it in the very heartland of the great jam vs cream debate: Killerton in Devon. 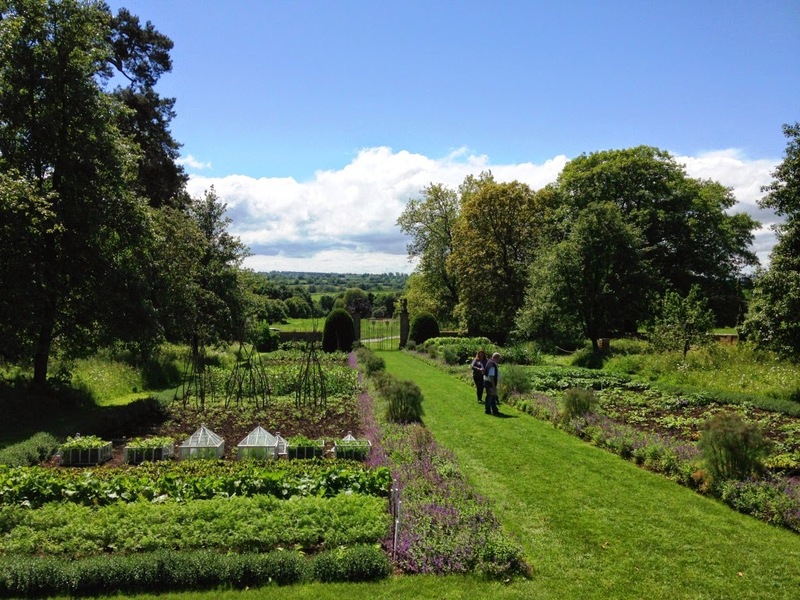 Killerton is a very large estate, covering 6,400 acres. The house was built in 1778 for Sir Thomas Acland and remained in the Acland family until it was given to the National Trust. The Aclands had a fascinating history that would make a really good TV mini-series, if TV companies hadn't stopped making mini-series in the 1980s. The last Acland at Killerton was Sir Richard. He was an intriguing man - he was elected as a Liberal MP in 1935 but then became a Socialist and formed the Common Wealth Party with J.B. Priestley. As part of his Socialist beliefs, he decided that property should be publicly owned and handed Killerton over to the National Trust. What his four sons made of this is not recorded. Killerton House itself is quite modest from the outside but inside it's a nice size with well apportioned rooms. The Trust encourages visitors to have a go on the piano and organ, which is always good to see. There was no guidebook at Killerton - there were printing errors in the ones that had been produced, apparently, so none were available. It did force me to read the information cards in the rooms for once. 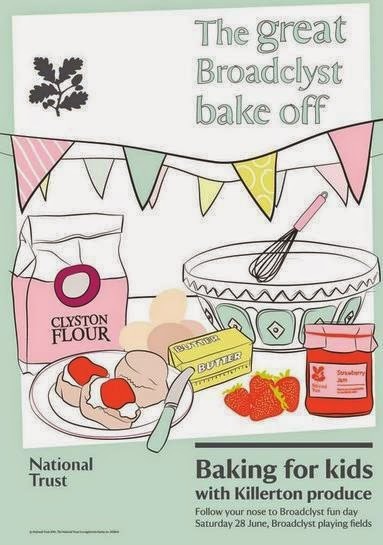 My visit to Killerton today had been inspired by a scone-off that they were holding for kids at a local fete. 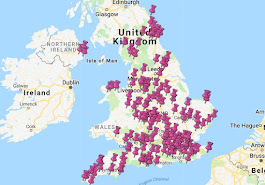 I believe that children are our future and when I am 105 with 239 National Trust properties still to visit, I will need someone to be baking the scones. I am forward-thinking like that. I was expecting fantastic things from my Devon scone, and if ten months of National Trust scone blogging have taught me anything it's that high expectations are a risky old game. So it was today. My scone was quite small and not particularly fresh, and it came as a cream tea for two, which meant one pot of cream and one plate...it was just a bit underwhelming considering we'd just come 160 miles. But never mind. Killerton has an amazing programme of events, covering everything from Shakespeare to bear hunts - well worth a look. I'm going to finish with an observation on how brilliantly British the whole jam vs cream debate actually is. Because let's face it, we're arguing about it while simultaneously loading both of them onto our scones in copious quantities. And people get very heated in the debate - "IT'S JAM FIRST!" " IT'S CREAM!" - until someone else invariably pipes up "what about butter?" and everybody looks at that deluded unfortunate like they just suggested eating a raw hedgehog. I love it. But whatever your preference, remember to keeeeeeeep sconeing. If you'd asked me last week to describe William Morris, I'd probably have come up with 'he made flowery wallpaper'. There were two National Trust firsts for me today. Firstly, we pre-booked a house tour. I never do this, because I like to see what the visitor experience is like if I just turn up. However, you can't access Red House until 1pm if you don't book, so we did. I really recommend the tour. 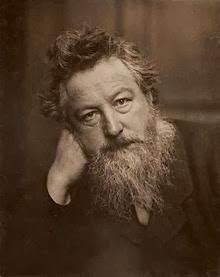 We learned that William Morris went to study at Oxford, where he met Edward Burne-Jones, the artist. They developed a love of the medieval that led Morris to initially pursue a career in Gothic architecture. While he was working for an architect he met Philip Webb, who went on to build 60 or 70 houses, but Red House was Webb's first commission. Together Morris and Webb created a building that is really quite stunning. On the outside it combines red brick with Gothic features, while inside it is unfurnished but contains a number of artefacts that give you some idea of the Morris 'look'. As Morris and his pals created items for Red House, they also formed a company - Morris, Marshall, Faulkner & Co. - which made similar fittings and fixtures and furnishings for a wider audience. In the process they created the Arts & Crafts movement and an entire aesthetic that was taken up in the UK and elsewhere. Morris only lived in Red House for five years before having to sell up and move back to London where he had his business. Red House was owned by sympathetic architects and artists over the years, until the Trust acquired it in 2003. The second of my National Trust firsts today involved me reading TripAdvisor reviews of Red House. I don't know why I did it and I'm still in shock: three people marked it as Terrible. 58 people had given it Excellent or Very Good but three human beings actually went to Red House and looked round and came away and went on their computers that night and wrote that it was 'Terrible'. The people that volunteer and work at National Trust properties must honestly sometimes wonder why they bother. Anyway, I loved Red House and I am going to say so on TripAdvisor. Let's move on to the scones. Morris and his family ate from blue and white plates when they lived at Red House, so it was a nice touch when my scone turned up on one. It was a tasty scone with a well-fired bottom, and it provided further evidence that a scone eaten outside in the sunshine tastes at least half a point better than if the same scone were eaten indoors (see also Mompesson House and Brownsea Island). FINALLY, FINALLY, FINALLY I made it to Cliveden! Woo-hoo! Every single time I've suggested going there, my other half has vetoed it for no reason other than he "doesn't feel like it". He was only two when the Profumo scandal broke, so it's unlikely that he's hiding any involvement in it. And let's face it, Cliveden will always be known for the Profumo affair. On balance I'd say it has been a positive thing for them - saying "I'm off to a wedding at Cliveden - you know, the Profumo scandal" carries an air of sophistication about it, compared to "I'm off to a wedding at Cliveden - you know, the plutonium leak" or "you know, where that serial killer hid all the bodies." ANYWAY. You can't just wander into the house at Cliveden as it's now an extremely posh hotel. I did try to persuade His Reluctancy to stay over (in the name of research) but he baulked at £462 a night. 2. 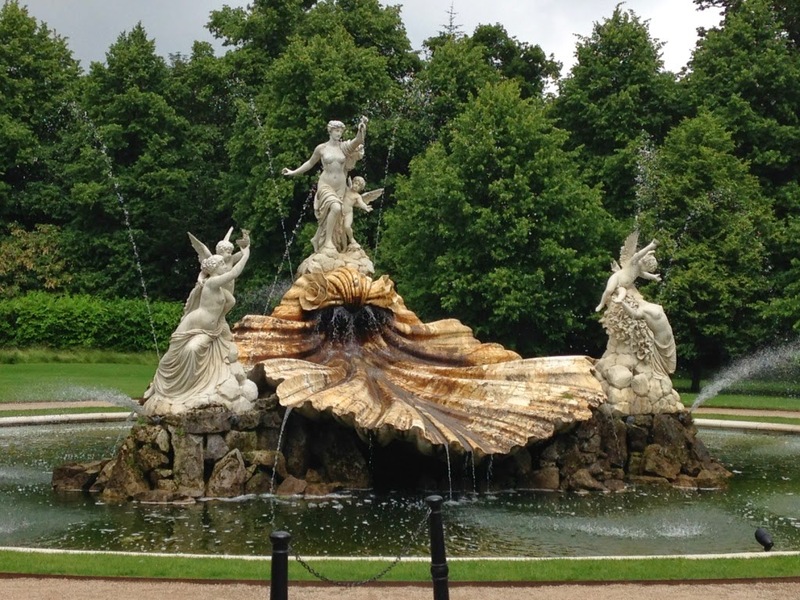 The Borghese Balustrade & The Cliveden Snail - the sculpture in the Parterre (see picture above) was brought to Cliveden from the Villa Borghese in Italy by William Astor in 1896. National Trust Guidebook Factoid of the Week: in 2004, a colony of Mediterranean snails was found living on the Balustrade - they must have been stowaways when it was imported and somehow the colony has managed to survive for over a hundred years. Let's hope Nigel Farage doesn't find out. 3. The Maze - William Astor first created the Maze in 1894 but by the 1950s it was a forgotten mess. 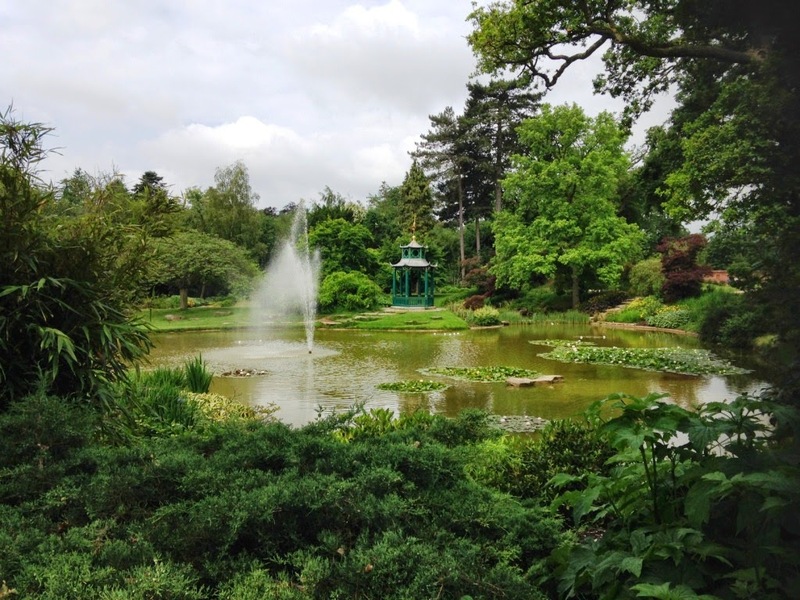 The National Trust recreated it and it was opened in 2011 by Alan Titchmarsh. I don't know why this amuses me - Alan is the John Fleming of our times after all, although I don't think John had a chat show. 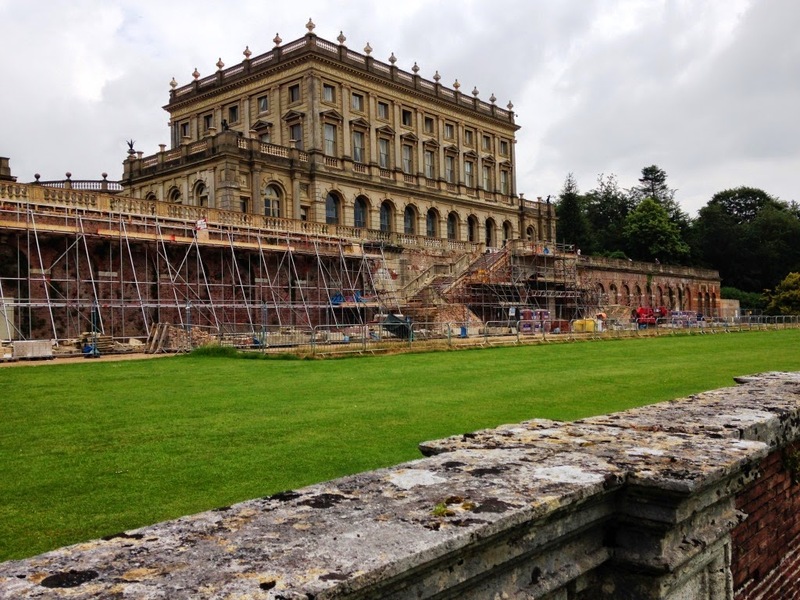 There has been a house at Cliveden since 1666, although a couple of them have burnt down. The building you see today was designed by Charles Barry for the Duchess of Sutherland in the mid 19th century. 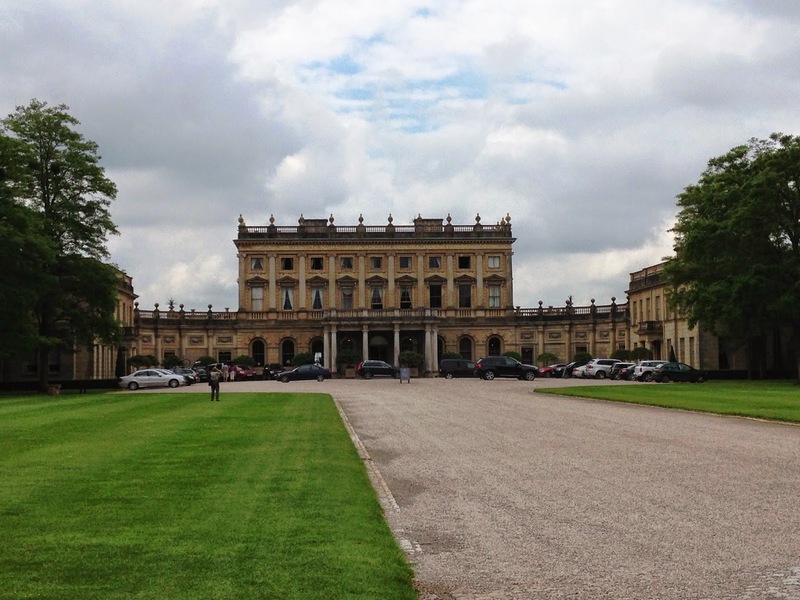 In 1906, William Astor gave Cliveden to his son and daughter-in-law, Waldorf and Nancy Astor, whose connections in political, literary and artistic society because known as The Cliveden Set. Nancy was an incredible woman - she was the first female MP for one thing and Nancy: The Story of Lady Astor is well worth a read. In 1961, Waldorf and Nancy's son Bill had inherited Cliveden, Waldorf having died in 1952. Bill rented a cottage on the estate to the osteopath Stephen Ward, who entertained friends there, including a Soviet naval attache called Yevgeny Ivanov and call-girls Christine Keeler and Mandy Rice-Davies. Bill also liked entertaining and one evening he and his guests, which included John Profumo, the Secretary of State for War, crossed paths with those of Stephen Ward. Profumo began an affair with Keeler, who was also involved with Ivanov, and the whole thing blew up into the mother of all scandals in 1963. Profumo had to resign, the Prime Minister Harold MacMillan went 7 months later, and the Conservatives lost the next election. I have to say, I absolutely love the idea. It seems to me that it's very much in keeping with the spirit of Nancy Astor, in that it's very bold and from what little I know of her, she wasn't a woman for small gestures. I wasn't there long enough to see anyone using it, although there were a few toddlers eyeing it up. 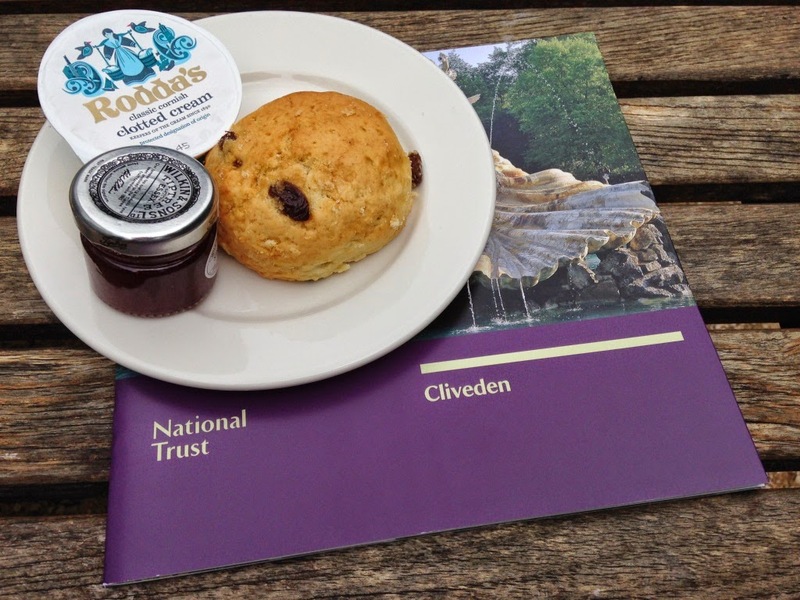 Cliveden also wins another award, this time for the smallest scone yet seen on the National Trust Scone Odyssey. A cream tea cost £4.25, which isn't the most expensive I've encountered, and I bet you'd pay a LOT more in the hotel, but even so - it felt a little bit measly. It wasn't the greatest scone in the world either - it wasn't very fresh and it somehow seemed a bit soggy. BUT! There WAS a choice of jam! And The Orangery is a smashing place to rest your weary legs when you're parterre-d out - I could have sat there all day. There was a distinct lack of Profumo-inspired souvenirs in the shop, which was a shame as I'd have liked a 'What Would Christine Keeler Do?' mug. 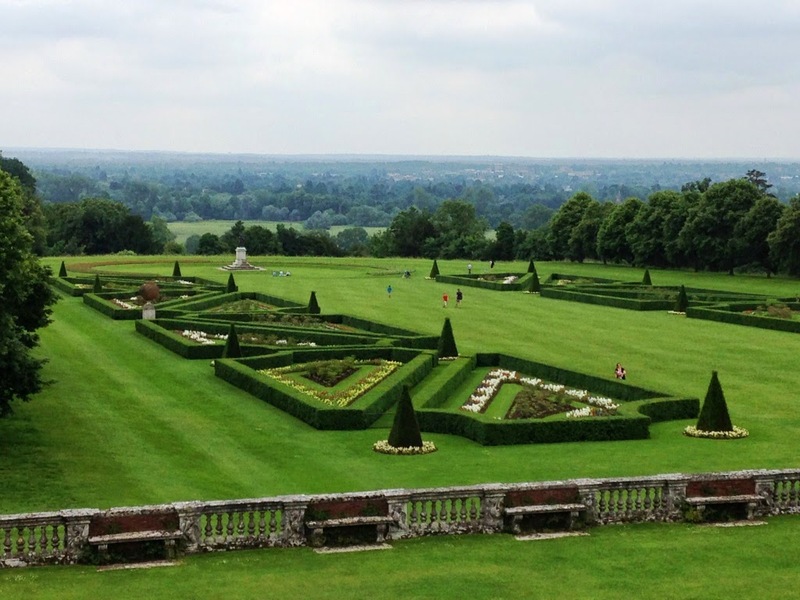 But I definitely recommend that you fit in a trip to Cliveden as soon as you can. It's like Waddesdon Manor, in that it's utterly magnificent and you have to see it to believe it. 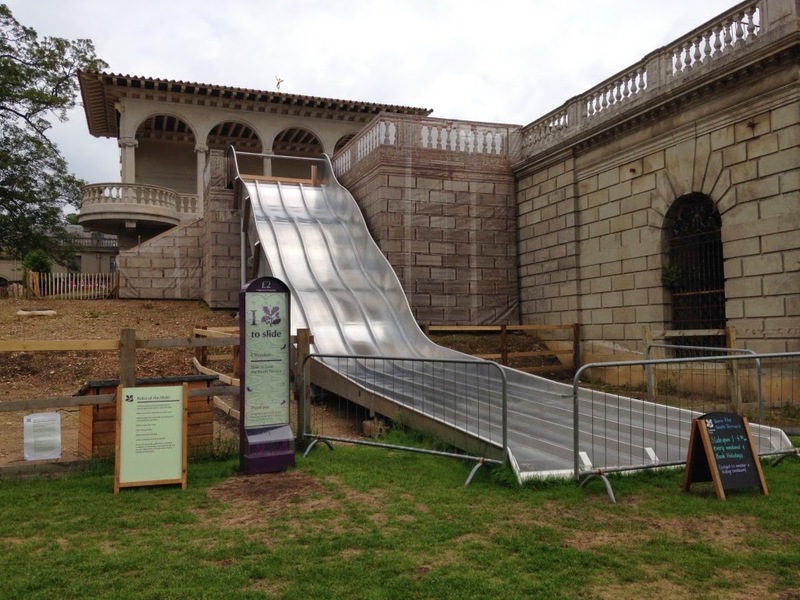 Plus, at which other National Trust property can you go on a massive slide? I am now going to risk being disowned by my parents and tell you that my family was not really into visiting historic places of interest when I was young. I remember being 6 or 7 and wanting to go to Rockingham Castle and my dad generously saying "as soon as your mother passes her driving test she can take you anywhere you want." So I waited and she did indeed pass her test soon after, but 33 years on and the trip to Rockingham is yet to materialise. 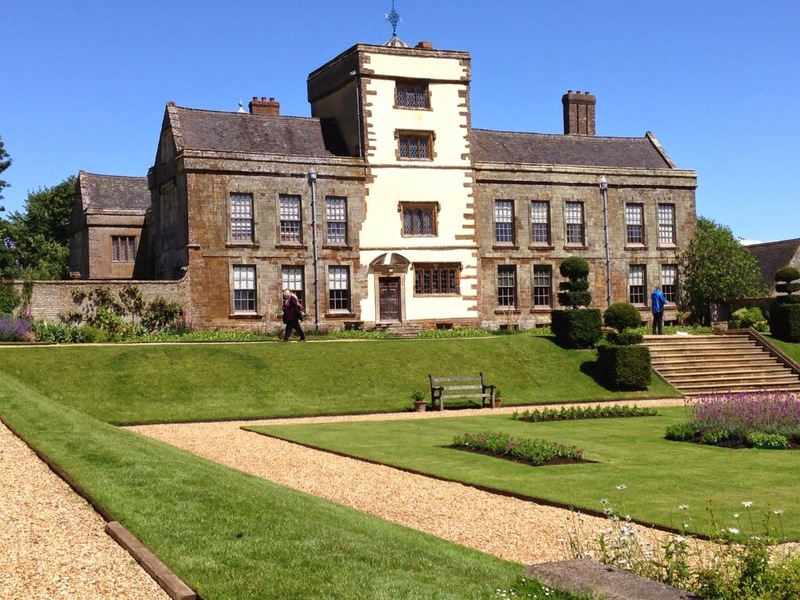 Anyway, Canons Ashby in Northamptonshire isn't far from where I grew up but I had never been. I decided to invite my family along, although the last time my sister and I attempted a scone mission it was an unmitigated disaster. This time I put some ground rules in place, namely 'let's set off before 3pm and it might still be open'. Canons Ashby was originally a priory, established in 1147. Henry VIII did away with the monasteries and gave Canons Ashby to Sir Francis Bryan, one of his cronies. Soon after, it ended up in the Dryden family, who owned the estate from 1551 to 1981, when they gave it to the National Trust. 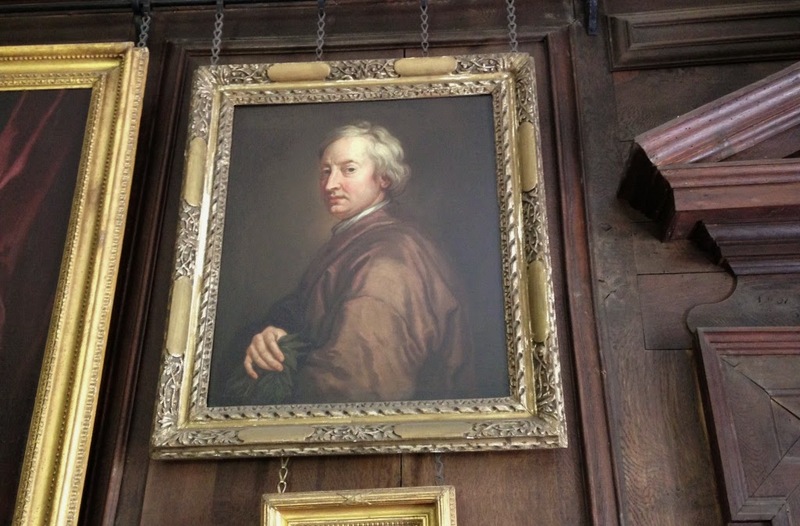 John Dryden, who inherited in 1551, was responsible for extending the original building. He was followed by a long line of ancestors who left their mark on the property, which is displayed today as it would have been when Sir Henry Dryden lived there. He took it over in 1874 - when his wife gave birth to a girl he was hugely annoyed and sacked two female members of staff because there were too many women in the house (his wife reinstated them). The church next to the house is well worth seeing. It's part of the estate owned by the National Trust and there's a model in the bell tower showing the scale of the original church - it was a mini cathedral before it was greatly reduced in size. The gardens at Canons Ashby are also stunning, extraordinarily neat and tidy with fantastic views of the Northamptonshire countryside. The view is visible from many of the rooms and it's enough to make you want to move in tomorrow. 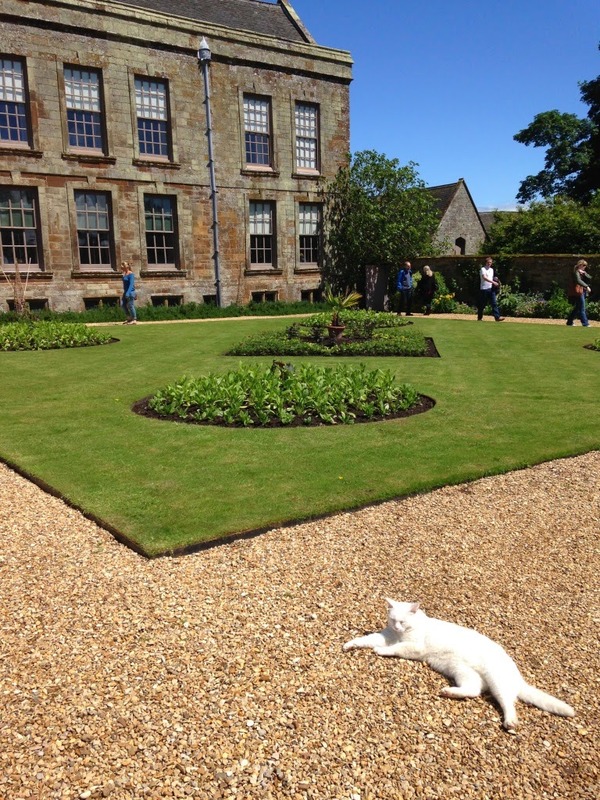 Canons Ashby also has a cat that has clearly been on the National Trust Tourist Management for Cats training course. It came up to us, lay at our feet, rolled about a bit, and then boldly continued on its way to meet and greet the other visitors. I'm not having a go at Jock the cat at Chartwell but I would suggest that he might like to learn some of the Canons Ashby cat's moves if he gets the chance. But onto the scones. They're strange things, scones. I've had scones that are light and fluffy and I've snaffled them down in about four seconds, with room for six more. And I've had scones that are a bit Tardis-like - they look fairly small but when you start eating there's a LOT of scone. 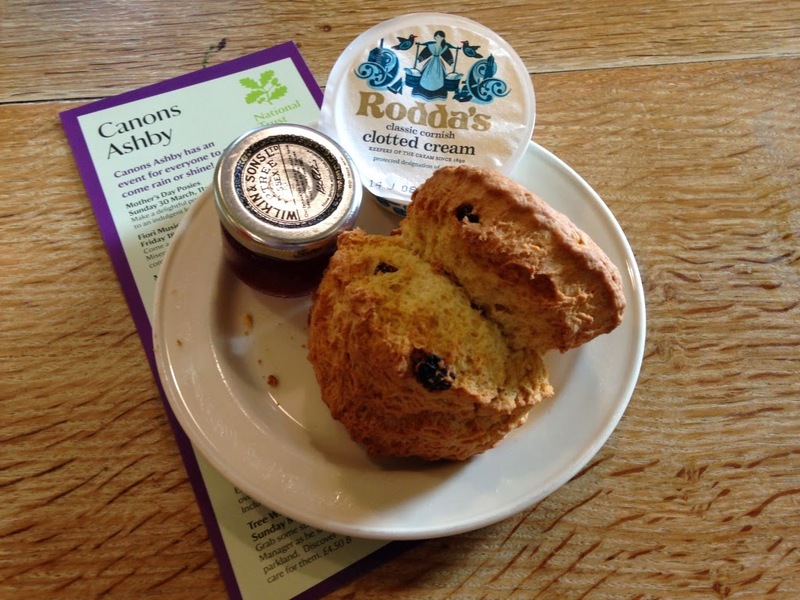 The Canons Ashby scone was definitely of the latter type - crispy on the outside and so, so tasty. 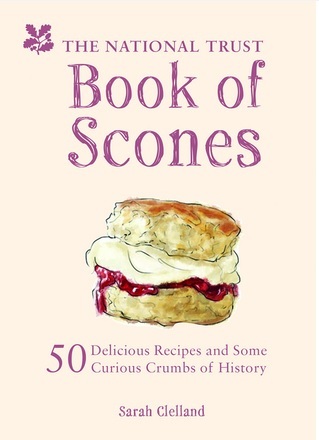 The scone got the highest accolade from my sister, who went back for a second. And she did that thing that happens a lot with my mum and her family - she offered my mum half and my mum said "No thanks" and my sister gave her half anyway and my mum ate it. But the highest praise of the day went to the tea. I've mentioned before that I have never had a bad cup of tea at the National Trust and when my mum said "this is a lovely cup of tea" - this is a woman that KNOWS tea - my opinion was validated. I'll finish with a note on how much of an eye-opener it is going to a National Trust property with non-members. As we drove out of Canons Ashby, my sister said "That's SO nice, the man on the gate waved us goodbye. Make sure you put that in your blog." And I thought 'of course he did, we're at the National Trust'. But she's right - it's not a given and it was a lovely touch.